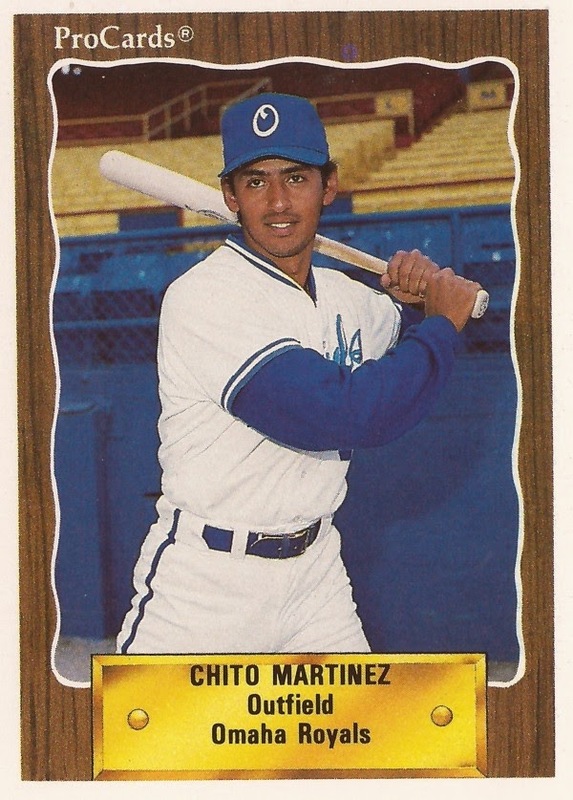 Into his third season of major league ball, Chito Martinez found himself in a slump in April 1993. There was a line of lefties, whom he didn't face, according to The Baltimore Sun. When he did get into games, he didn't hit. In 19 plate appearances, he got zero hits. So, in late April, Martinez was sent down - to AA. "I never wanted to go back to the minor leagues, but I'm here," Martinez told The Sun in late April. "I'm going to try to keep a good focus and do what I can to get back there [the major leagues]." Martinez didn't spend long at AA Bowie, he spent five games there. He also spent another 43 games at AAA Rochester that year. But Martinez never played another game in the majors. Martinez, a native of Belize who grew up in New Orleans, got his start drafted by the Royals in the sixth round of the 1984 draft. He stayed with the Royals system for seven seasons, never getting called up to Kansas City. He started at short-season Eugene in 1984, hitting .301. He made AA Memphis in 1986, hitting 11 home runs and had an average of .304. He hit his first home run that year in May, extending a Memphis lead again later with a two-run single. Martinez first made AAA Omaha in 1987, for 35 games, but didn't return to AAA until 1990. He spent the interim back at AA Memphis, hitting 13 home runs in 1988 and 23 in 1989. In one April 1988 game, Martinez hit two home runs in a Memphis win. When 1990 came around, Martinez hit .264 with 21 home runs. But the Royals didn't see him as a prospect anymore, The Sun wrote. The Orioles did. Signing with Baltimore, Martinez spent a couple months at AAA Rochester, then got his call up in July. He became the first native of Belize to make the majors. He also got off to a quick start. He debuted July 5, hitting his first home run in his fourth game July 11. On July 15, he hit his second home run, his first game-winner. He broke another tie two weeks later with a seventh-inning homer that proved the game-winner. In August, Martinez hit two home runs in Mike Mussina's first major league win. He hit a total of 13 home runs for Baltimore that year. His final one on the year was also the final one hit at Memorial Stadium. By 1992, Martinez was primed for a break-out year, but for a bad shoulder and a bad slump slowed him. "Other guys tell me that I have a job all wrapped up," Martinez told The Sun in March, "but they aren't swinging my bat. I spent a lot of time in the minor leagues. I've only got a half-season in the majors. There has been a little doubt on my part." Martinez' slump continued into the season, starting 2 for 25 in his first 15 games, according to The Sun. Still, Martinez played in 83 games in 1992, hitting .268, but only five home runs. By 1993, Martinez was on his way out, with his dismal performance in April. It was his last season with the Orioles. He hung on for two more seasons in the minors, with the Yankees and with the Rockies, wrapping up his career.